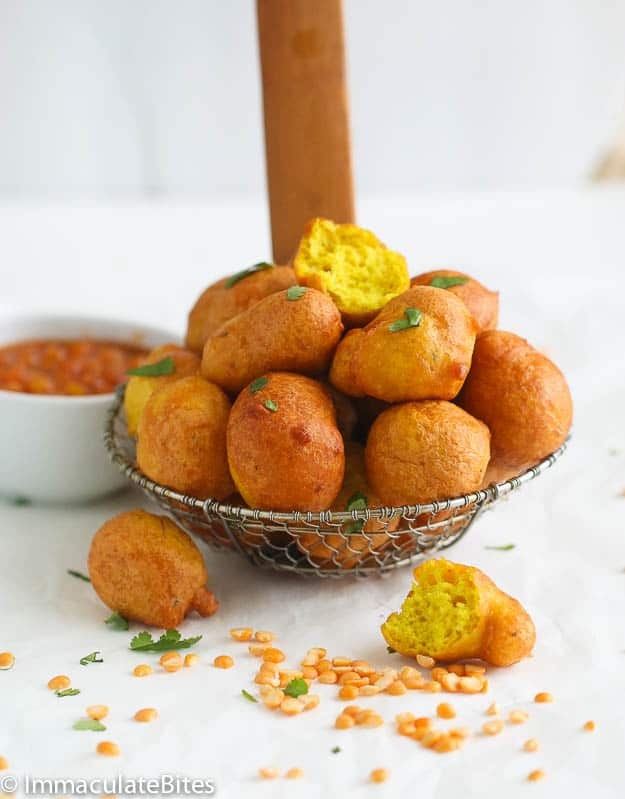 Easy Pholourie :Deep fried spicy split pea dough . Slightly Crispy on the outside, yet some what light and fluffy on the inside . 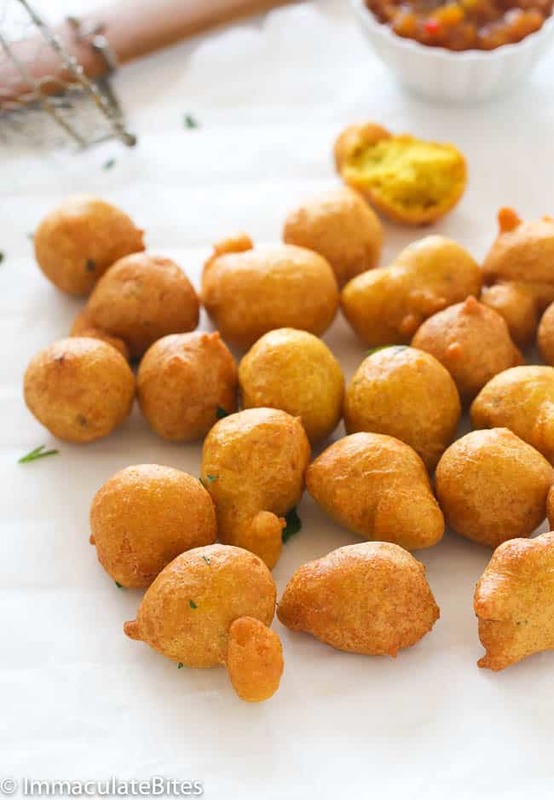 This Incredible flavorful street snack is enjoyed throughout the Caribbean Island especially in Trinidad, and Guyana. This could seriously be a problem, after biting in to it you would understand why it is a problem. A while back I attended a Trinidad event and I got to taste these delectable balls and they spoke to me. YES, they sure did. I didn’t know much about them so I did a little research to find out more. And let me tell you…these deep fried spicy dough are Amazeballs. Like, literally. Ok, I must admit, deep fried is are my love language. Just a glance in my collection here and you would agree. I truly believe it is tied to my identity. But more important, I feel most people just have that warm feeling and memories when it comes to it. 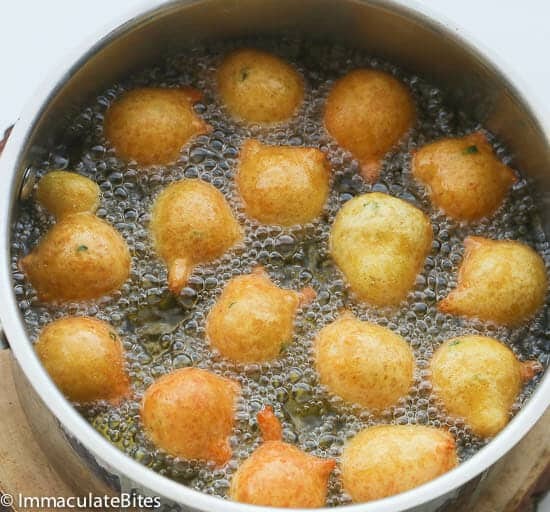 These delicious balls are not your ordinary puffs . 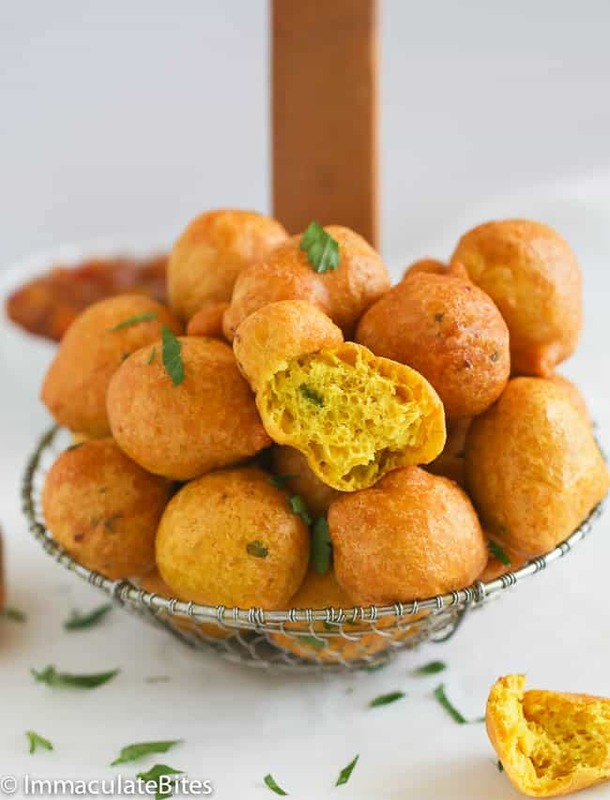 These are highly spiced and flavor packed; made with flour, split pea flour- flavored with onions, garlic , cumin, pepper, curry and cilantro. Soft on the inside and slightly crisp on the outside- especially when they just come off the fryer. Seriously what’s not to love? You need to eat at least 3-4 right out the fryer. My orders! As with most street food there are many variations to the recipe some more seasonings and different ratio of flour to split peas. Adjust to preference. You can also make it without split pea. If you are not too fond of split pea flour. I took the liberty of adding about 2 teaspoons of sugar in the batter. Not traditional. So purist, hold your horses, it’s not overwhelming and really adds rather than detract from the overall snack. And of course, feel free to completely scroll pass the sugar and pretend like you didn’t even see it. I don’t judge. Making these phoulorie- pronounced poo loo ree , can be really quick if you go the baking powder route. But if you want to go the yeast route then you are going to have to wait a little longer. No fear here its just chilling time and no kneading. Enough time for you to do some chores or make this pineapple and mango chutney right here to go with it. They pair beautifully together. 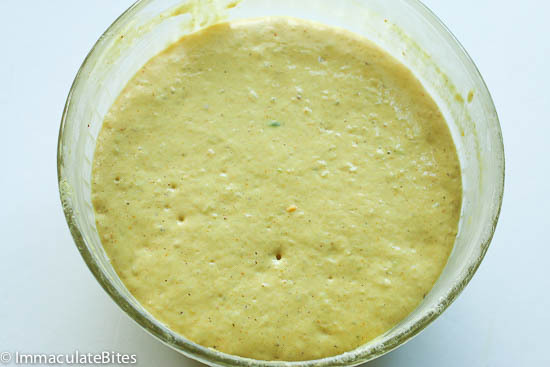 In a mini food processor blend together cilantro, parsley, garlic, onions and scotch bonnet pepper until puree. If you do not have a processor finely chop the ingredients and smash using a motor and pestle or rolling pin. 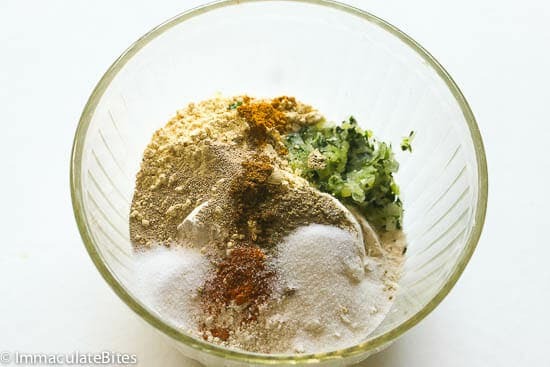 If you have green seasoning use about 2 Tablespoons instead. 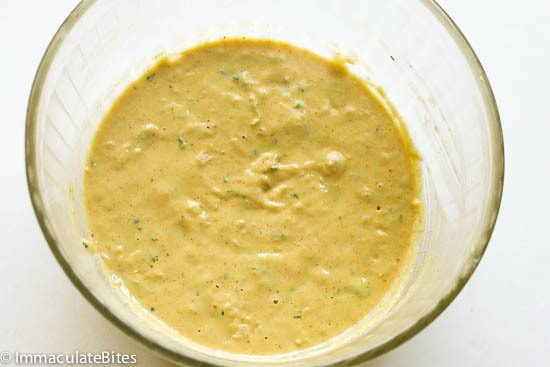 In a large bowl combine all ingredients except the water ; flour split pea and all-purpose, yeast, salt sugar cumin, turmeric, curry, onion mix and yeast. Thoroughly mix. Then add warm water a little at a time until you get to desired consistency – like thick pancake batter. I usually use about 1 1/3 cup . Thoroughly mix preferable with your hands. In a large, sauce pan pour vegetable oil, until it is at least 3 inches (or about 5 centimeters) high (too little will result in flatter balls), and place on medium heat until oil is about 375 degrees. Fry for a few minutes (about 7 minutes or more until the bottom side is golden brown. Turn the ball over and fry for a few more minutes until the other side is slightly golden brown. Use a large spoon or something like that to take it out of the oil. I usually place them on napkins right away to soak up some of the excess oil. What is a good dipping sauce for these Pholourie? Hi, Russell. 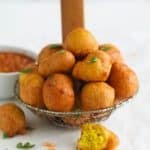 You can check out this Mango Chutney here >>> https://www.africanbites.com/mango-chutney/ It pairs well with these Pholouries. God bless you and this awesome sauce!! My Haitian tastebuds were in overdrive andI didn’t know if I should give up on this vegan journey but your site has given me so much hope!! This looks great. I will try it as soon as I buy the ingredients. Looks healthy! Thanks also for the step by step pictures! You’re most welcome, Roxanne! Please let me know how it works for you. Enjoy! 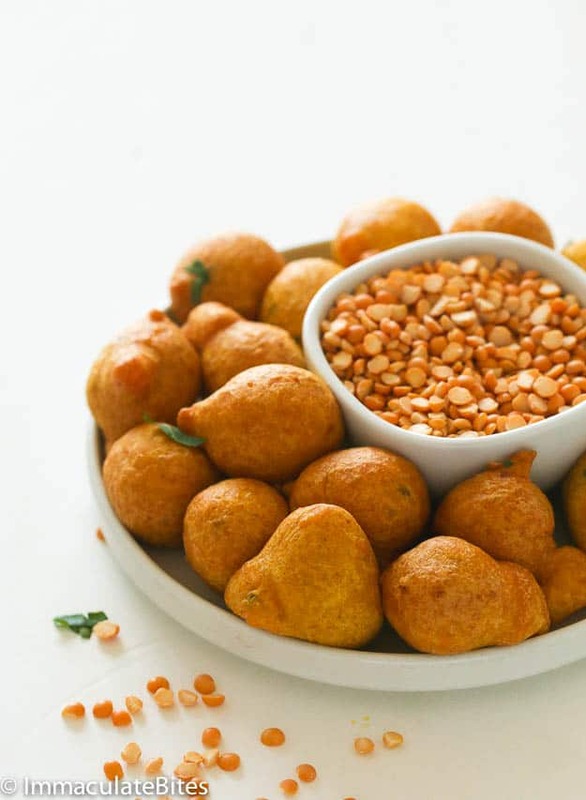 Pholourie is one of my favorite Trini/Caribbean snacks…. and your recipe looks AMAZING! Can’t wait to try it! My mouth is watering now just thinking about dipping them in tamarind and hot pepper! Awesome! Do let me know how it turns out. Thanks. Hi love your recipes everything! Love the added sugar as well it made me smile, cause I love to stray away at times. not saying you did but it’s kool anyway can I boil the split peas and mash it, if I don’t want to blend it?! You sure can . However, you have to adjust the thickness consistency . Tried it today left out the cumin, pepper and onion,used 1/2 teaspoon ground geera instead,no cilantro used shadon beni. Thanks for the feedback Dessie! Like your recipe. I did notice that you said baking powder could be subs for yeast. Wish you had the substituted amount of baking powder to use instead of yeast! Yes, you can use baking powder about 2 1/2 teaspoons. I love! your website. 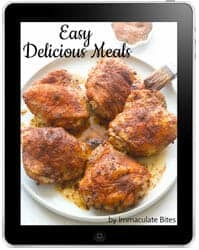 am from Nigeria but love carribean recipes and your recipes look easy to make. Currently in school (no cooking allowed) but will definitely try some when I get home. Great work! Thank you Aeilsa! Can’t wait to see which ones you try out. Yum, I had never heard of Pholourie before. Your photos are absolutely incredible. I love the shots in the strainer. Talk about a trip to the islands in one amazing bite! I tried something similar while vacationing in the Caribbean, I can’t wait to try your recipe because it looks so tasty! They sure are . Do let me know how it works out for you if you do make them . Thanks! Wow I’ve never seen anything quite like these. They look delicious! I love the flavors you have going on here. The texture just looks amazing! Thanks Sarah! You sure can. You can grind it using coffee grinder . Or soak for a couple for about an hour or two and then grind. If you live in the uk it is called gram flour. ‘Fraid not. 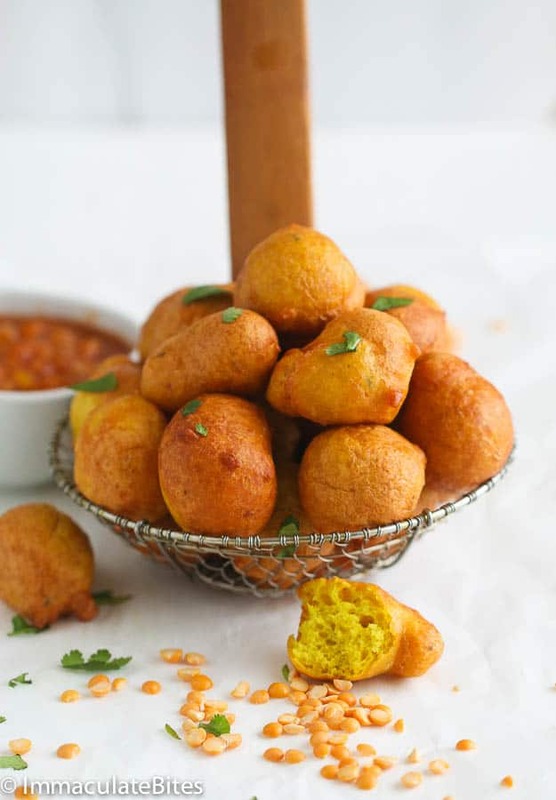 Gram flour is chickpea flour.